1st September, 2010: FISHING REPORT: Port Alberni Inlet, Barkley Sound, Ucluelet (West Coast), Somas-Stamp River System. September is now here and the salmon runs are quickly migrating back to their various watersheds on the west coast of B.C. and areas further to the south in the states of Washington and Oregon. The Fraser River is experiencing its largest return of Sockeye salmon since 1913. The estimated return is 30 million. Port Alberni experienced one of the largest returns of Sockeye salmon in the last 10 years with probably 1.4 to 1.5 million Sockeye returning to the Somass River. The West Coast of Vancouver Island is experiencing a huge migratory flow of Chinook salmon which began with early summer runs in late April. The salmon swimming to southern watersheds, mainly the Columbia River and Fraser Rivers systems, continue to be strong and recreational fisher people on the west coast are still having many unbelievable fishing days. Many scientists are wondering what happened out in the ocean to create such a bountiful return of salmon along the Pacific West Coast this year. Most suggest that ocean conditions over the last three to four years have been just right for salmon survival. This means water conditions were perfect which created rich food resources for the salmon during their life cycle out in the North Pacific Ocean. It has been suggested that due to “global warming” many dead spots in the ocean had been found during the late 90’s and into the early 2000’s which created a huge mortality rate on the various species of salmon as they swam out of their spawning river systems to the ocean. These so called dead spots have not been as abundant in the last few years. September is now here and many recreational anglers are preparing to fish for some big Chinook and Coho that are making their way to their spawning grounds. The many salmon still swimming coastal waters have been viciously feeding on the huge quantities of sardines and pilchards and have put on a considerable amount of weight. It is not uncommon that September is the month that Chinook come close to forty pounds and Coho can weigh in at fifteen to twenty pounds. 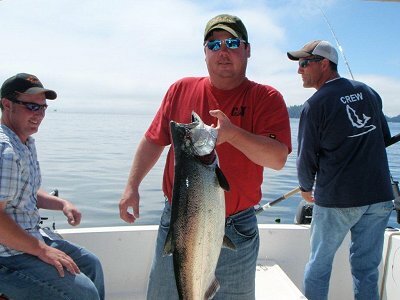 September in its early stages is often referred to as the prime time for fishing for “big salmon”. Port Alberni is hosting for three days, its very own Labour Day Weekend fishing derby, known for the past several years as the Port Alberni Salmon Festival. The Salmon Festival has big cash awards daily for the biggest three salmon and a $10,000 first place prize over all. Ucluelet has hosted a Ladder Derby that has seen several big Chinook weighed in during the summer months. 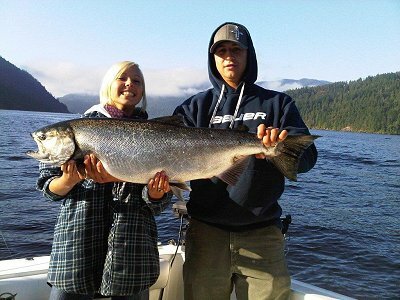 June, July, and August have had several Chinook salmon weighed in and there have been many big cash winners each month. On September 11th and 12th the Ucluelet Derby will hold its final “tournament” with the summers top fifty prize winners eligible to fish for a grand prize which has not yet been revealed. We are looking forward to some great September fishing not only out in the ocean but also in the many coastal rivers. The Stamp River will open for recreational salmon and Summer Steelhead fishing. Many avid river fisher persons are looking forward to some great fly fishing for summer Steelhead, sometime after the 10th of October when there are salmon eggs floating in the water of the Stamp River after much of the natural spawn. Sockeye Salmon have continued to trickle into the Inlet and have stayed in deep water waiting for cooler water in the Somass River. Some anglers have continued fishing for Sockeye at 100 to 120 feet at Cous Creek, Underwood, and the Narrows. To date the Chinook fishing in the Inlet has been slow. 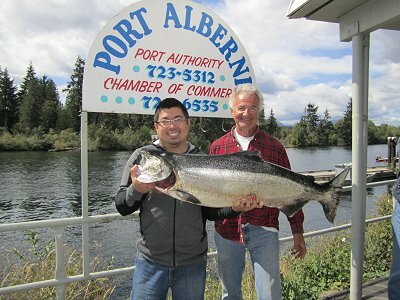 Over the past weekend anglers had some reasonable fishing in the harbor with some fish landed weighing 15 to 25 pounds but for this time of year one has to wonder where the Chinook are. The Department of Fisheries has determined that the total Chinook return to the Somass and then Robertson Creek Hatchery is 43,000 pieces with only 9,000 fish determined as surplus for the recreational catch. This number is for Barkley Sound and the Inlet in terms of any catch determined as Robertson Creek Chinook. Anglers that have had successful days in the Inlet have picked up their fish on anchovy using glow teaser heads and O-15 and O-16 hootchies and the mp-2 and 15 and 16 with 42 inches of leader behind various hotspot flashers. The AORL 12 hootchie has also been working with a glow bead in the head. One guide from Slivers Charters Salmon Sport Fishing has done well with this hootchie and recently landed a 37 pound Chinook for a guest from Victoria. There is some rain predicted this week and it is hoped that this will move some fish from offshore areas into the Sound and then up into the Inlet. Barkley Sound fishing has been also off and on with some good days occurring when fish are moving through. The Bamfield Wall and Whittlestone have had some good days for Chinook and Coho sport fishing. The fish in this area have been hitting bait in green and clear Rhys Davis Teaser Heads and six and seven inch Tomic Spoons and some plastics in green and white. Gilbraltor, Swale Rock, Diplock and Pill Point have also been okay when fish are moving but the days of fish holding for long periods of time seem not to be the norm this year. During the past weekend and Monday the 30th of August guide boats did well fishing in 45 feet to 60 feet of water between Diplock and Pill Point. Good sized Coho ranging from thirteen to eighteen pounds were in the area as were Chinook in the high teens to twenty pound range. A green anchovy teaser head and a plain red hotspot flasher seemed to be a good combination for the Chinook and a five inch silver glow coyote spoon behind a purple or blue-glow hotspot flasher worked well for the Coho. 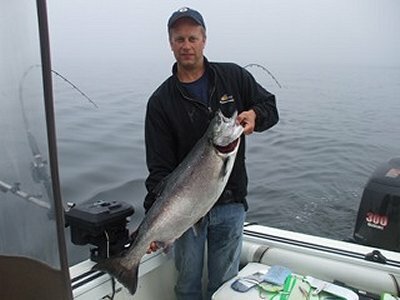 Coho have been far and few between in the Sound and surf line areas throughout the summer but seem to be showing up now, which is a great sign for some good fishing opportunities. There should be plenty of Chinook and Coho showing up in Barkley Sound over the next two weeks. Hopefully there are plenty of salmon in the area for the Port Alberni Salmon Festival. The West Coast inshore and offshore fishing has been remarkable over the last number of weeks. Areas of South Bank, the South West Corner, Starfish and The Wreck have all had some incredible salmon fishing. There have also been some remarkable days of late on the water in terms of the open water being calm. Early August saw a lot of fog but the last 10 days has seen more flat water with no fog than what is the norm. September is referred to as the month with no fog and no wind. Hopefully this stays true. We are expecting some great salmon fishing to continue this month. It seems that all of the locations mentioned above have all had some good Chinook fishing and little by little there seems to be more Coho showing. This year has been the best Chinook fishing on the west coast in years. Many times you see boats with not one but two fish being played. Most of the early fish were 12 to 18 pounds but recently many of the Chinook have been weighing in the mid twenties to mid thirties. There have also been a good number of Chinook in the forty pound range landed. Some guides are having success fishing in shallow water from 40 to 60 feet on a fast troll using six and seven inch plugs or Tomic spoons with no flasher. Others are using big spoons with a flasher in deeper water from 90 to 125 feet. Both methods seem to be working. Many different spoon colors seem to be working. The different banks seem to be full of pilchards and the salmon are gorging themselves on them. This is one of the reasons why the bigger plugs and spoons have been working so well. The best plugs for some of the guides have been a 212 and a 158 as well as a 500re. A tomic 900 and 793 and 232 have also been good. It is wise to have different spoon colors and sizes on ones boat when fishing out on the banks. Various colors and spoon sizes are of importance. Halibut fishing has been good on the Big Bank and also at The Wreck. 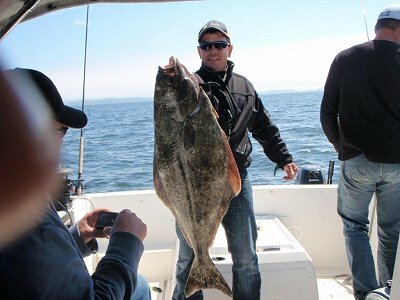 Many fisher people have been picking up halibut on the troll off the bottom and fishing for salmon in the mid-water. Let’s hope September is another great fishing month. The months of June, July, and August have been phenomenal.